It’s almost March, which means Spring is not far behind. When I was growing up on the East Coast, we learned that March comes in like a lion, but goes out like a lamb. It’s still true, but to a lesser extent, in the warmer climes of the Southwest. In speech-language therapy, it is time to wrap up those snowy, winter themes and break out the blooming flowers, lucky clovers, and hopping rabbits. 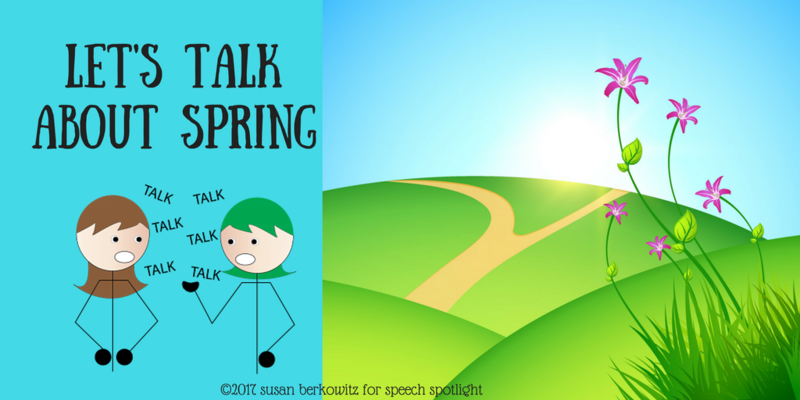 The speech-language pathologists of Speech Spotlight have a lot of great resources and ideas to share with you. Did you know that speech-language pathologists work with all kinds of speaking, listening, language understanding and expressing skills? People are often surprised that we work on more than articulation disorders. And many are surprised at the link between difficulties with speech sound production and learning to read. I can’t promise that the SLPs of Speech Spotlight have resources for all of these areas, but we do cover the areas that are most useful or much-needed in pediatric or school-based settings. Who doesn’t love free stuff? Here are 2 language resources that are smaller samples of larger, priced items. 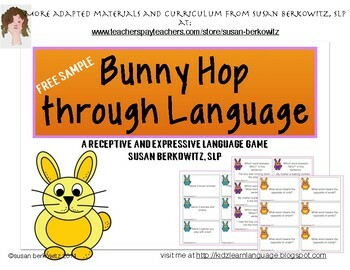 Practice building receptive and expressive vocabulary skills with these fun resources; a no prep, no print language building resource from Ashley Rossi and a print and go game for building language skills from Susan Berkowitz. AAC stands for alternative-augmentative communication. We usually mean picture-based or text-based language for students who either do not/cannot speak, or for those whose limited speech is not sufficient to meet their communication needs. 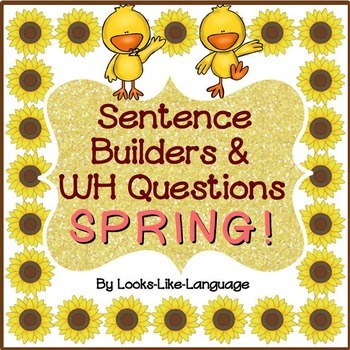 Here is a Spring nature hike-themed resource for practicing core (high frequency) words with AAC users. 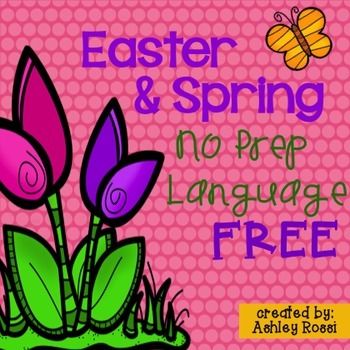 Did you know that your AAC kids can use the same materials as your other language learners? 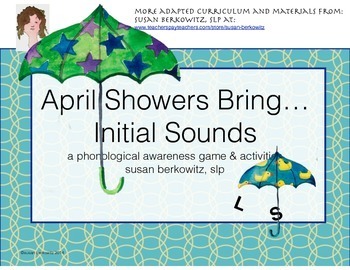 Speech pathologists are uniquely qualified to work on phonological awareness skills. These are called the Reading Foundation skills in the Common Core. SLPs work on early literacy/phonological awareness skills to help students with the language foundations upon which decoding and encoding are based. Here is a fun game with additional worksheets for identifying the initial sounds in words. Articulation errors are the most frequently – and easily – recognized focus of speech therapy. Some error patterns kids will grow out of as they develop. But for many kids these errors persist past developmentally acceptable ages, or so impact a child’s speech that he or she may be difficult to understand. 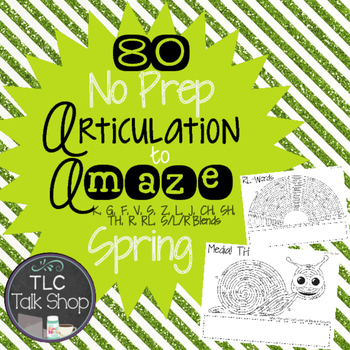 TLC Talk Shop has 80 no prep articulation mazes with a spring theme that will give your students loads of practice with their target sounds while having fun, too! Looks Like Language combines articulation and language skills in this great resource for mixed groups. SLPs also work on pragmatic skills. Pragmatics are the functions of language; the “why?” of the message, as well as the appropriateness of how the message is delivered. For students who need help with learning conversational skills, these mats are perfect from TLC Talk Shop. Language and literacy are very interrelated. I have always loved using literature in speech-language therapy. Books are an excellent way to work on language skills; including vocabulary, sequencing, retelling, and many aspects of grammar and sentence structure. You will find many book companions on TPT and, if you are a SLP working with kids, there are so many exciting things you can do to make language in stories come alive. Sequencing skills are crucial for life skills, as well. 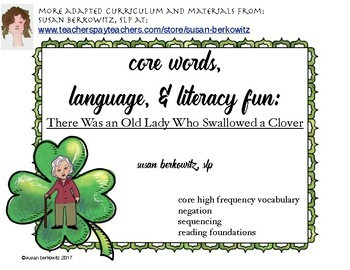 There are some books that are perfect for sequencing skills practice, like this one from Susan Berkowitz. 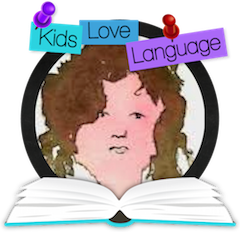 Areas of language we also work on are morphology, syntax, sentence structure – all of the forms of language, along with the vocabulary that is the foundation of reading and curriculum access. TLC Talk Shop has these great folding flap activities that look really fun and enticing. 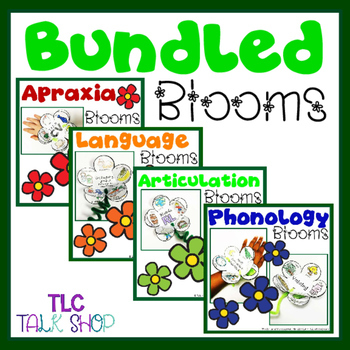 This is a bundle that covers articulation, phonology, language, and apraxia! If you’re working on building sentences, Linda from Looks Like Language has this great resource for you. Many kids on our caseloads have difficulty with flexibility of vocabulary. 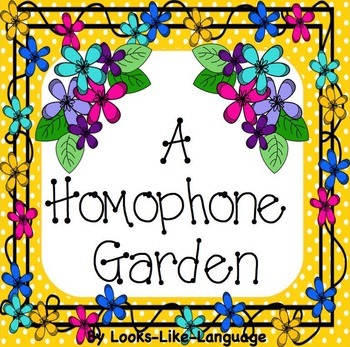 Here is a fun resource for working on homophones from Looks Like Language. 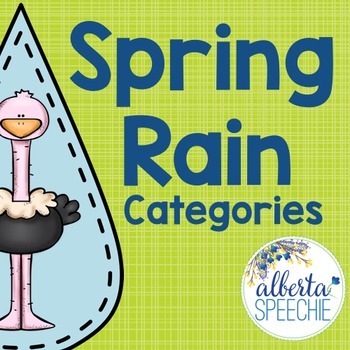 Alberta Speech has a great spring themed resource to build categorization skills at 2 levels of difficulty. Who doesn’t love working with nursery rhymes and folk tales with the younger kids we see? 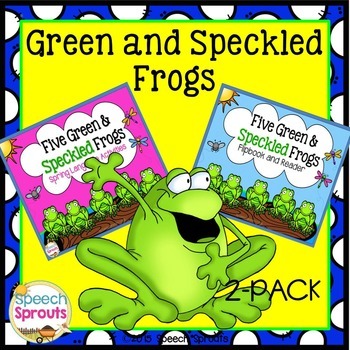 Speech Sprouts has some great resources for this group, including this one based on 5 Green and Speckled Frogs. And, as long as we’re talking about bugs and things that creep and crawl through the Spring, how about some Synonym Bugs? This no prep activity will help those students who are having difficulty with word relationships. 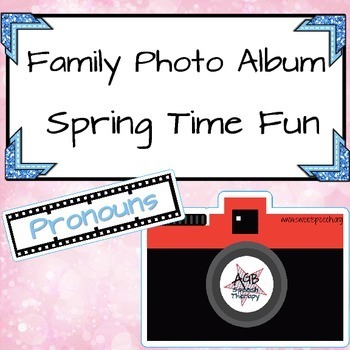 AGB Speech Therapy has a great set of resources with a family photo album theme for Spring, including working on pronouns, verb tense, and vocabulary. If you are working with students who have more significant language problems, here is a resource for students on the Spectrum, or who have significant language disorders. 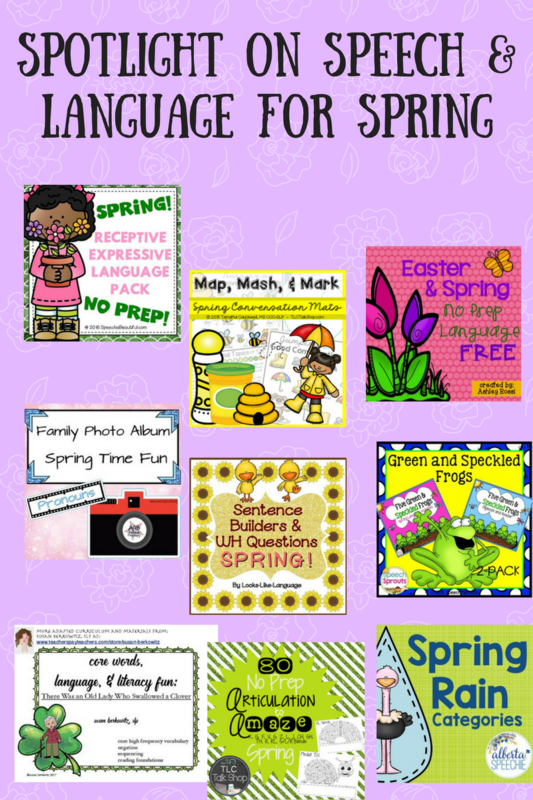 Everything Spring has vocabulary, sequencing, and much more. And, finally, here is another no prep – just print and go – receptive and expressive language resource from Speech is Beautiful’s Sarah Wu. What’s even better? It also comes in Spanish! These 2 resources have a lot of punch to them. Vocabulary, following directions, pronouns, prepositions, describing, compare/contrast, and answering questions. Wow! Cover many of your students’ targets with this one! Many of Sarah’s resources are bilingual, so if that is what you need, head on over to her shop. So, now you know just how far-reaching our scope of practice is, and have some great resources for your practice. Have a beautiful, warm Spring. Keep on talking!